The stormy weather of recent weeks has not made the hills very attractive. They've been cloud-capped, windswept and wet. Struggling over them on compass bearings in thick mist and driving rain has not been very appealing and it's a few weeks since I ventured onto the tops. 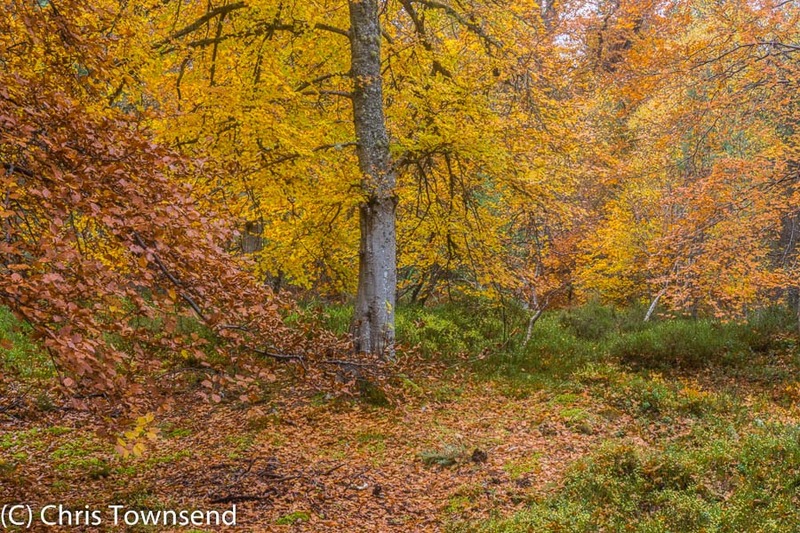 However at this time of year the woods offer a bright and colourful alternative to the greyness of the hills. Autumn colours are peaking now and this year the display is really glorious. 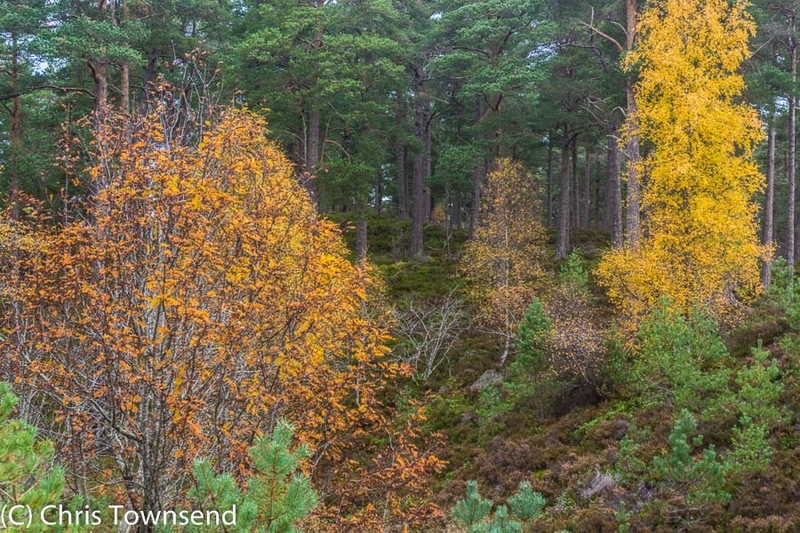 I spent a day wandering round Anagach Woods on the edge of Grantown-on-Spey marvelling at the intense colours. The gentle rain that fell - gentle in the shelter of the trees that is, in open areas it was harder and wind-driven - only served to amplify the brilliance of the leaves. 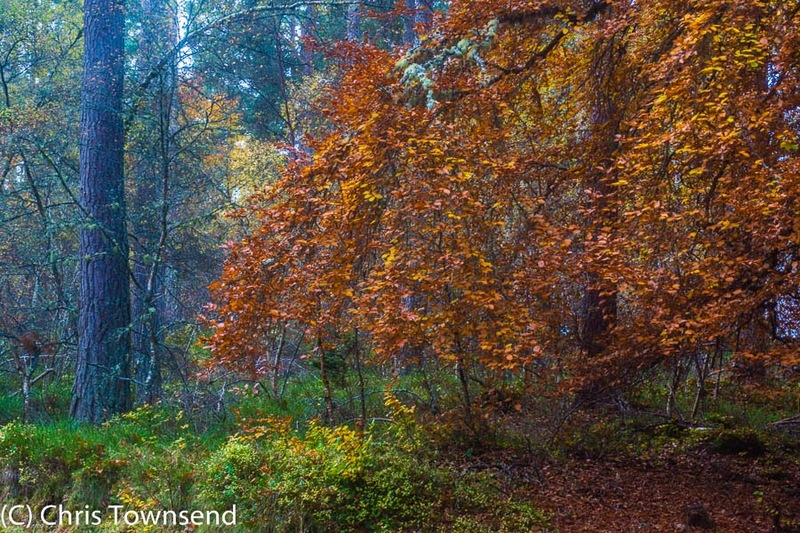 Anagach Woods are not ancient, being planted in the 1760s, but they are natural with much regeneration. This is not a plantation. Scots pine and birch are the dominant trees but there are many others including sessile oak, beech, elm, hazel, aspen, rowan and willow. The land is undulating with many glacial ridges and hollows, making for interesting terrain. 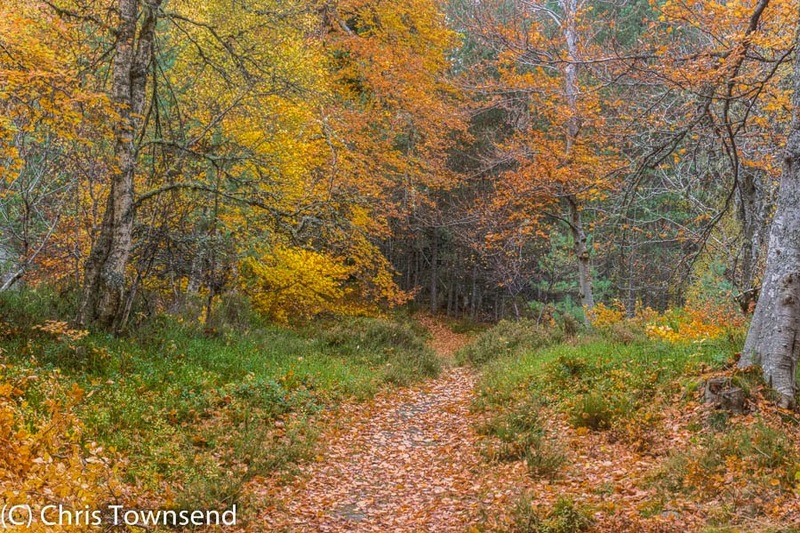 There are waymarked paths through the woods, including the Speyside Way, but I don't usually follow any one route, preferring to wander freely, following up anything that catches my eye, which on this walk usually meant flashes of colour. 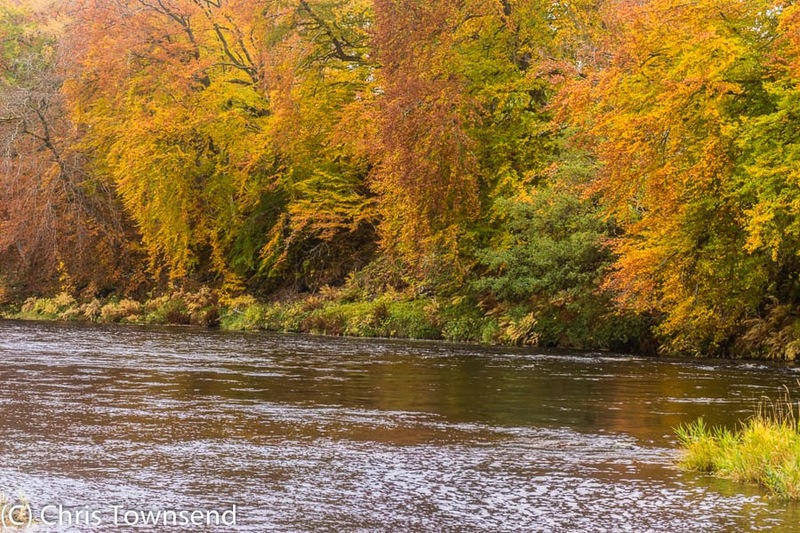 The woods are close to the River Spey and I ended up on its banks. After all the rain the river was high and fast. Goosanders and mallards swept past, allowing the river to drive them downstream. A coot skittered across the water, half running,. half flying. On the banks a fringe of trees glowed bronze and gold. Today strong winds are ripping the leaves from exposed trees. The temperature has fallen. 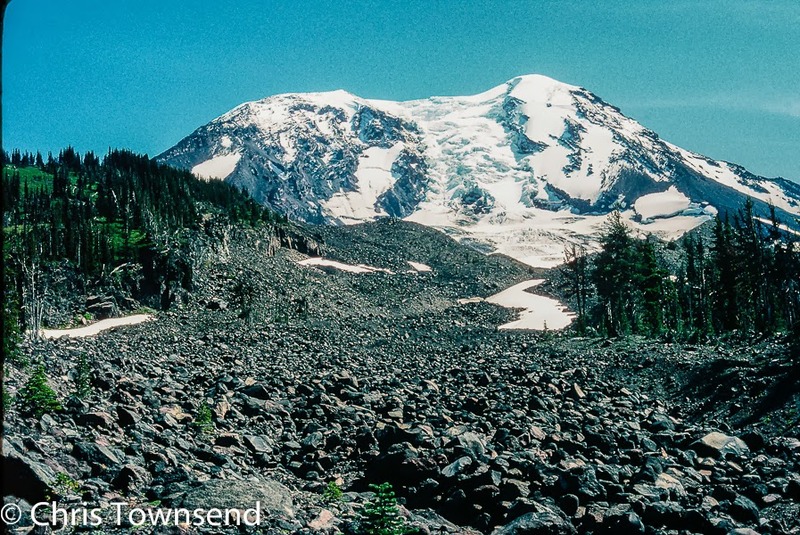 Snow is forecast for the summits. Winter is coming. The glories of autumn will soon be gone. Sometimes the weather just works out for the best. A few weeks ago I'd arranged to do some filming with Triple Echo Productions for The Adventure Show. The date was last Thursday and the forecast earlier in the week was not promising. But it changed and Thursday became 'the best-looking day of the week' in the mountain forecasts. And so it proved, a day of dryness in a week of wet weather. 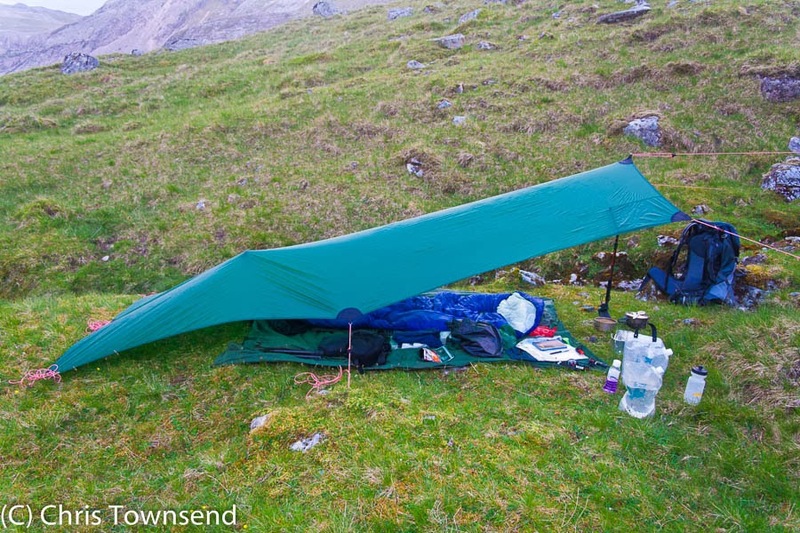 The night before was chilly with the rain falling as snow on the highest summits. It was still windy and we had to find sheltered spots to record voices. Clouds tore across the sky, layered and fractured, with rare flashes of sunlight slanting occasionally slanting through them. 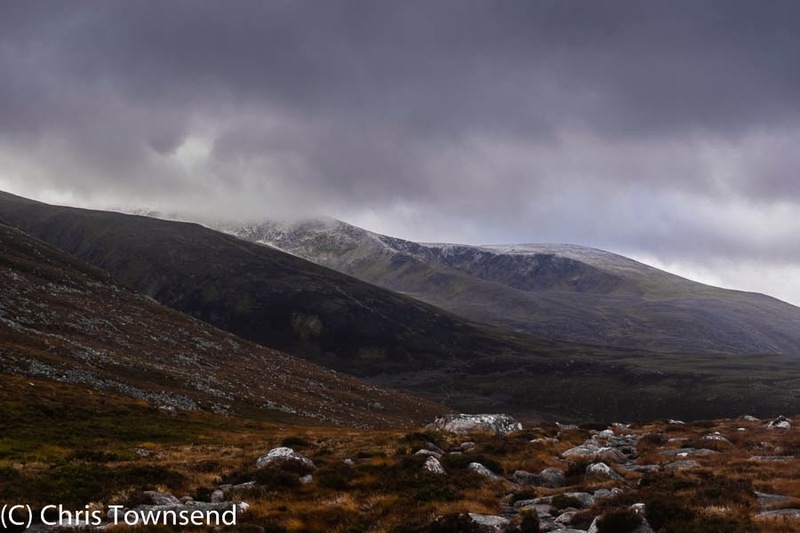 The air was cold, hat and gloves cold, which was good as we were filming for a piece about the Cairngorms in winter. 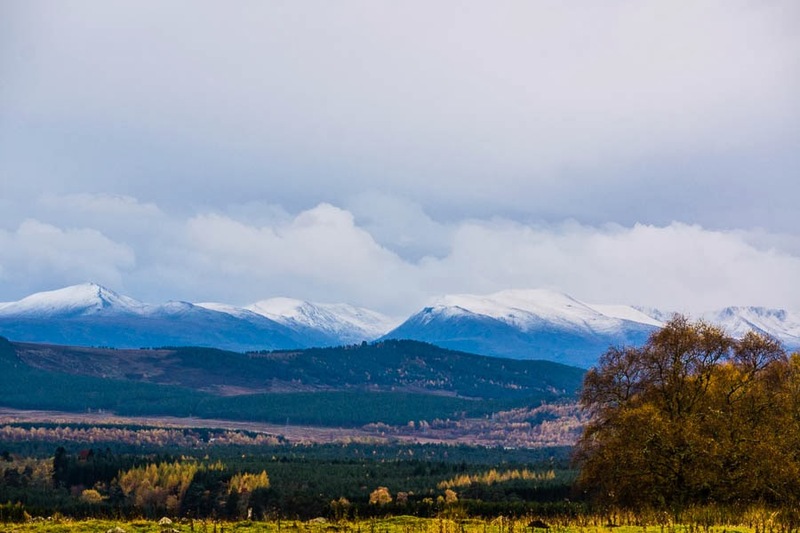 Appropriately, the clouds lifted at times to reveal a fresh dusting of snow high up. 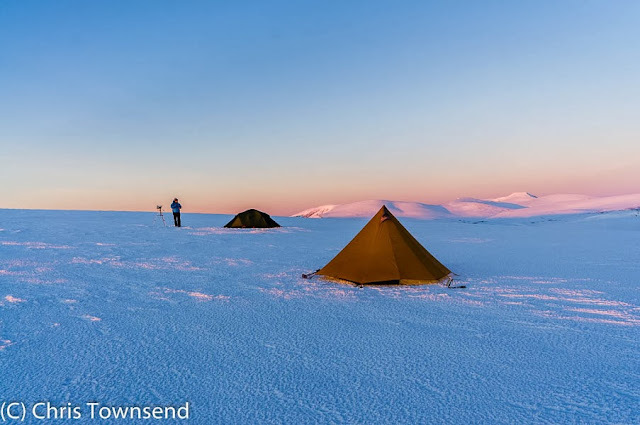 Filming takes time, as I know from making the Cairngorms in Winter film with Terry Abraham last winter. On this occasion we wandered across to the rocky ravine of the Chalamain Gap and back again, a distance of around 8 kilometres. We were out for five hours. I walked much more than that distance though as I repeated several sections so they could be filmed from different angles and vantage points. 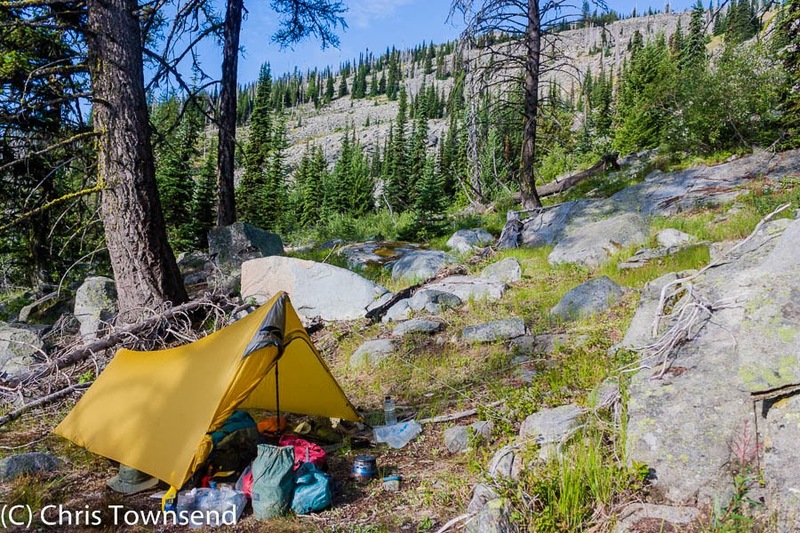 I also carried a full pack so I could be filmed pitching camp and then sitting in the tent talking about winter camping. 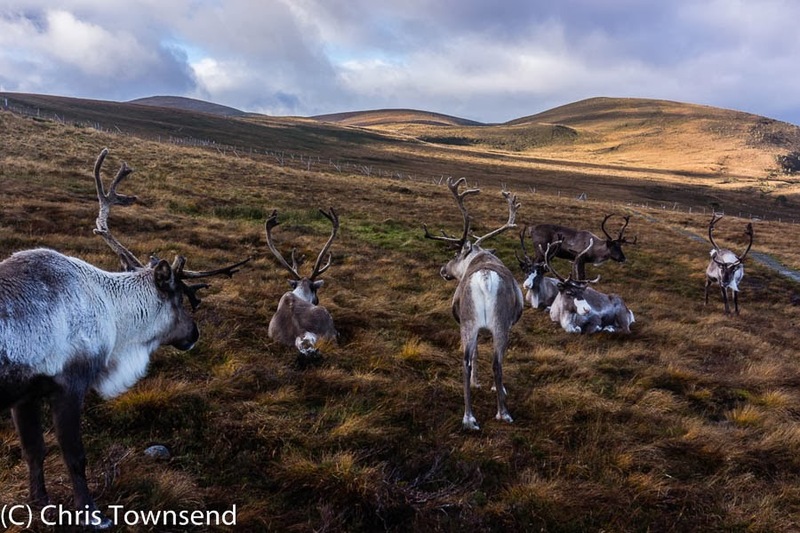 Our route took us past a big enclosure where the Cairngorm reindeer are often found when they're not scattered over the hills. 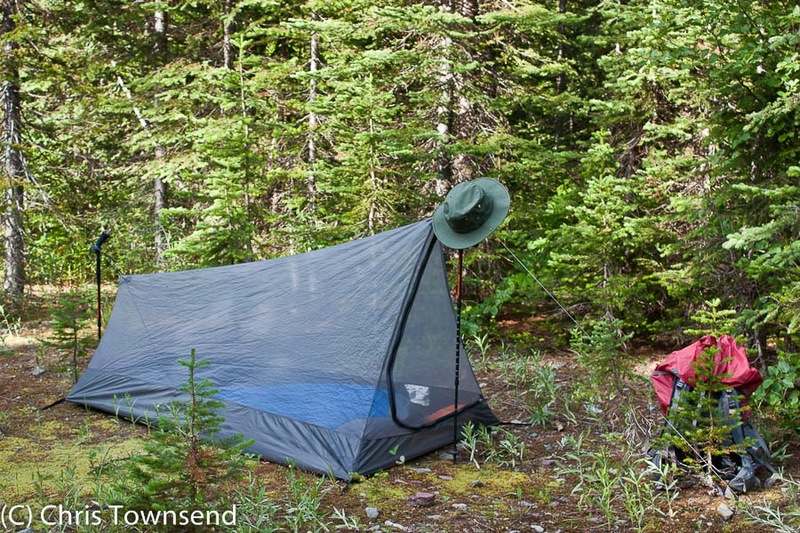 They were there that day, studiously ignoring us, though one did stare intently when I was pitching the tent. 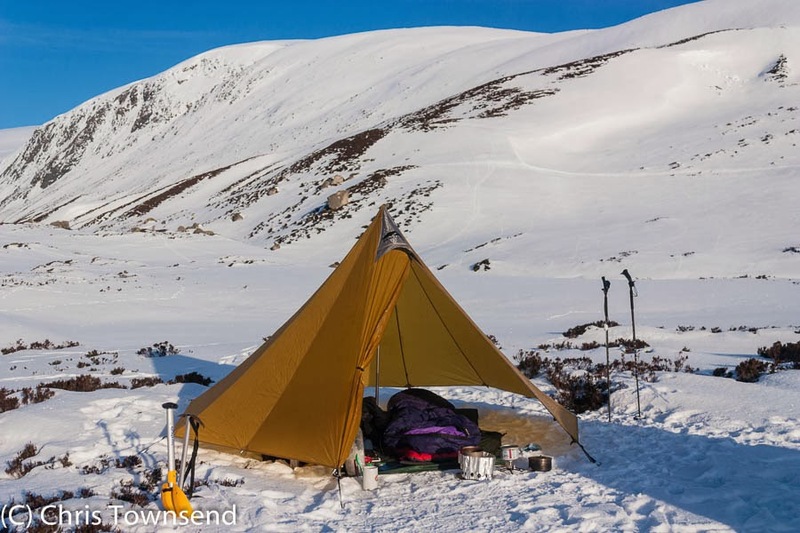 The piece will be broadcast in the Adventure Show on BBC2 Scotland in early December and will include clips from The Cairngorms In Winter film. 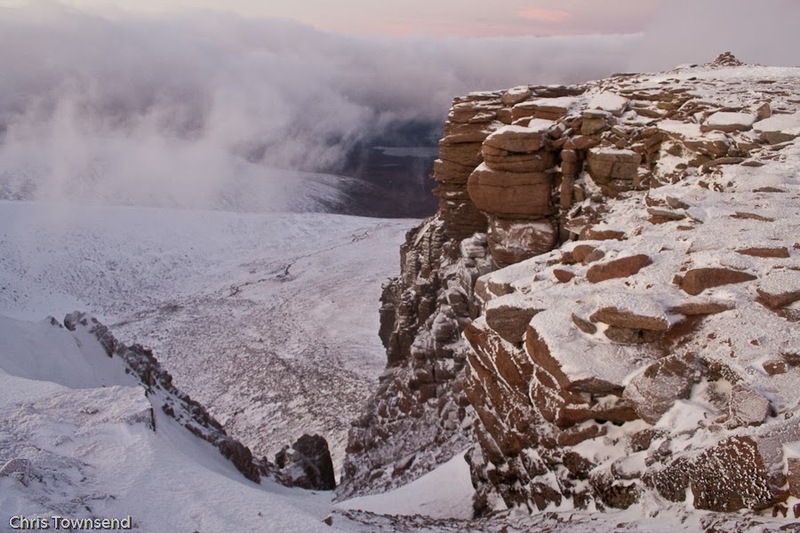 I'm pleased to say that Terry Abraham's film The Carngorms In Winter will be shown at the Kendal Mountain Film Festival next month. The film is too long to be shown complete so Terry has produced an extract for the festival - hopefully those who see it will want to see the complete film. The date and time of the showing have not been announced yet. I'll post them here once they are available. Peter Wright's Ribbon of Wildness was the inspiration for my Scottish Watershed walk (see all my posts for June and July this year). 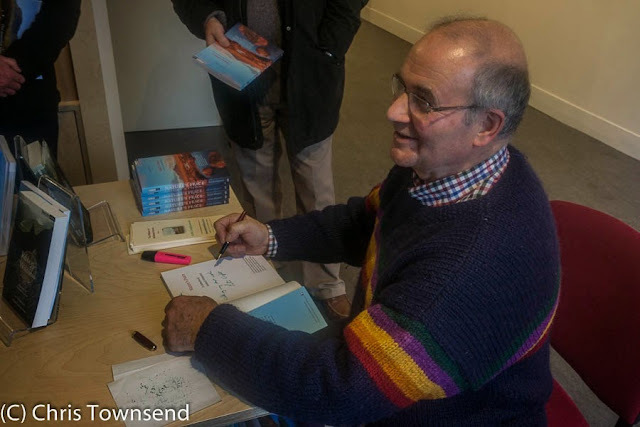 Yesterday Peter launched his new book on the Watershed, Nature's Peace, which is a celebration of both the Watershed and John Muir. 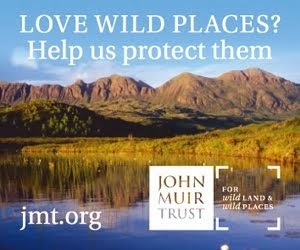 Appropriately the book launch was held in the John Muir Trust's Wild Space in Pitlochry. 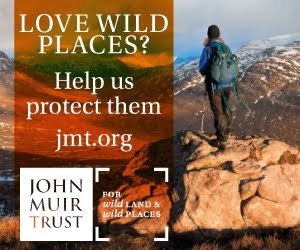 Next year is the centenary of John Muir's death and the book is also intended as a reflection on his important and inspiring legacy. 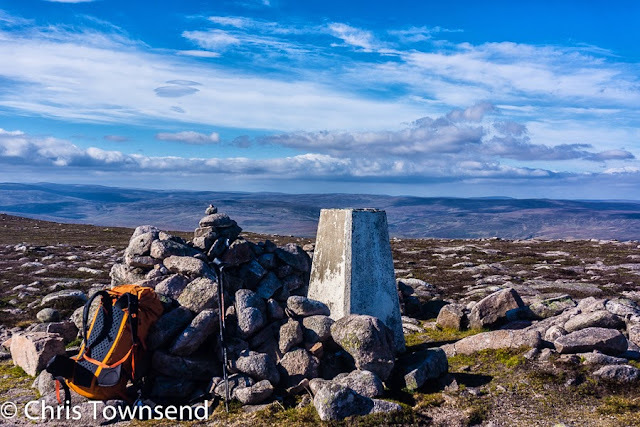 The title comes from Muir himself - 'Climb the mountains and get their good tidings. Nature's peace will flow into you as sunshine flows into trees. The winds will blow their freshness into you, and the storms their energy, while cares will drop off like autumn leaves'. 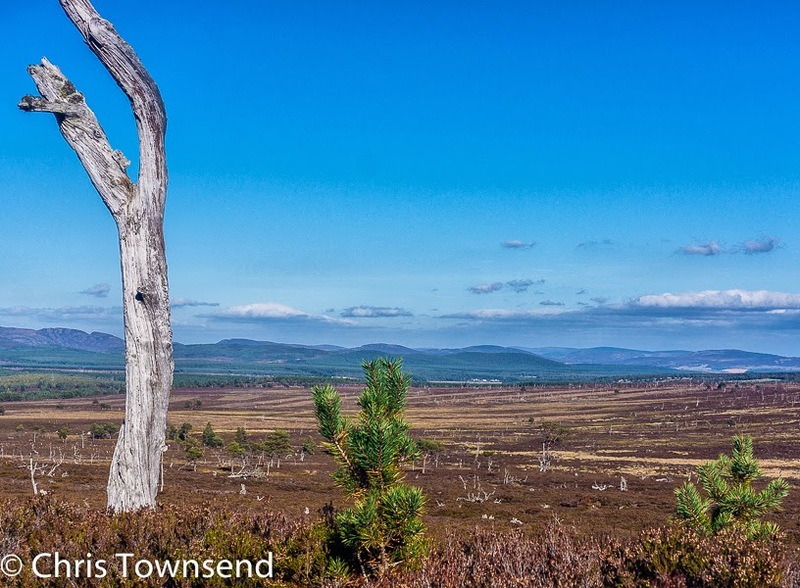 As well as Peter's thoughts on the Watershed and on Muir Nature's Peace also has what must be the first comprehensive set of photographs of the whole length of the Watershed. To achieve this Peter compiled work from over 30 photographers, including myself (though none from my walk as this was too late to fit into the design schedule). Many went out and took pictures especially. Looking through the book brings back many memories for me and the pictures should inspire any lover of wild land to go out and explore at least some of the Watershed. 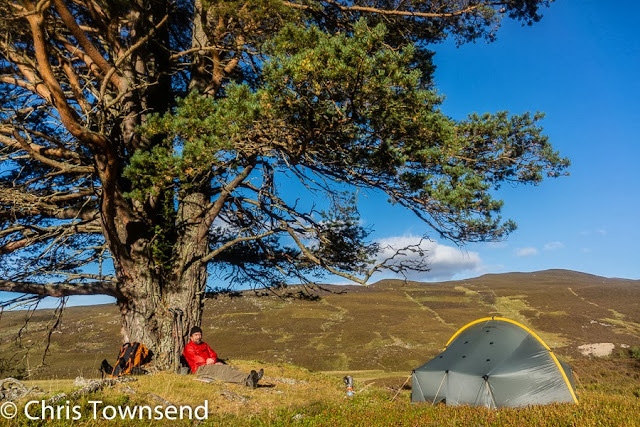 The Great Outdoors Awards are open for voting now. There are nine categories open to readers, including Outdoor Personality, in which I've been nominated, and Outdoor Books, in which my book Grizzly Bears and Razor Clams has been nominated. There are plenty of alternative worthy 'personalities' and books if you don't want to vote for me! But do please vote. The outdoor gear section of the awards will be voted on by a panel including myself. 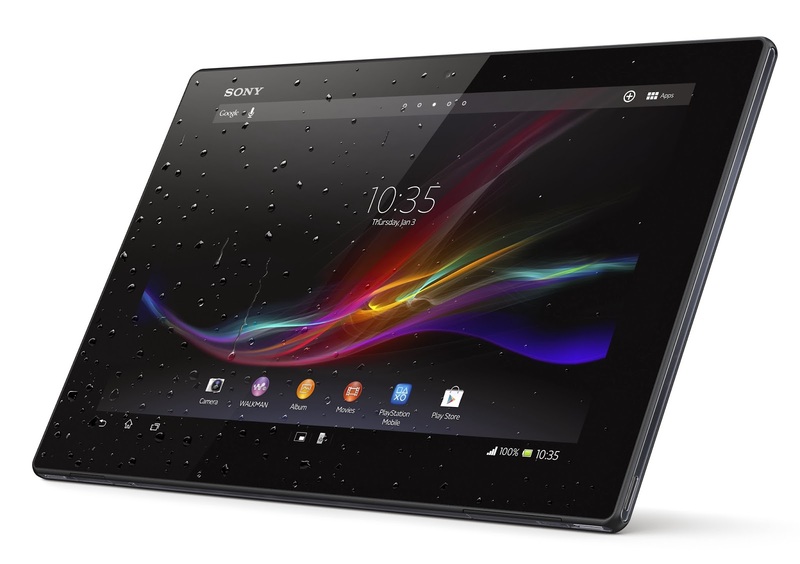 Products will be tested - I've been doing so recently. The Awards will be announced at a ceremony in Kendal on November 13th. 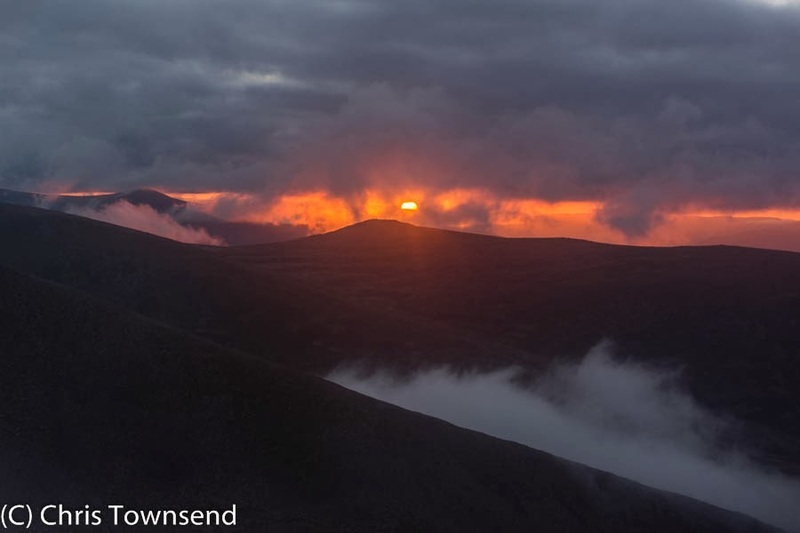 The Cairngorm Plateau is always a favourite place, even when the weather is stormy or cloudy. On this week’s trip it looked as unpromising as possible with thick clouds hanging low over the Northern Corries. 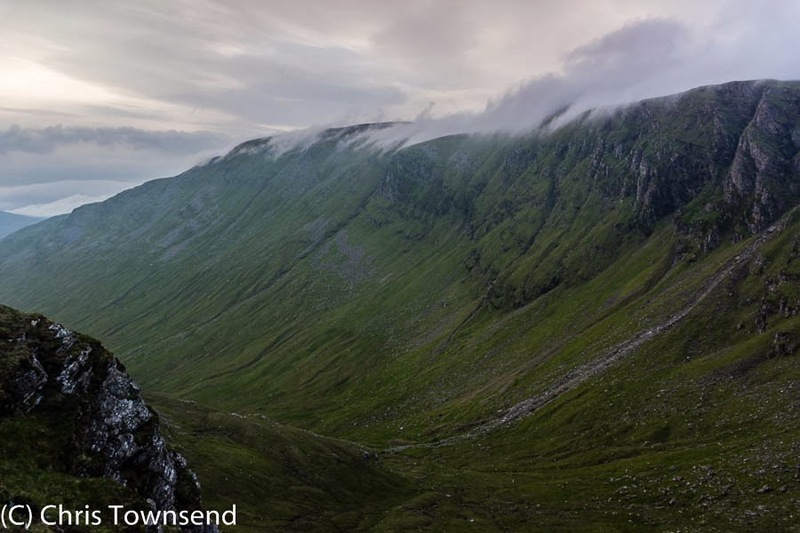 Hoping that the mist might lift a little I crossed the base of the corries, staring up at the splintered cliffs vanishing into the greyness. 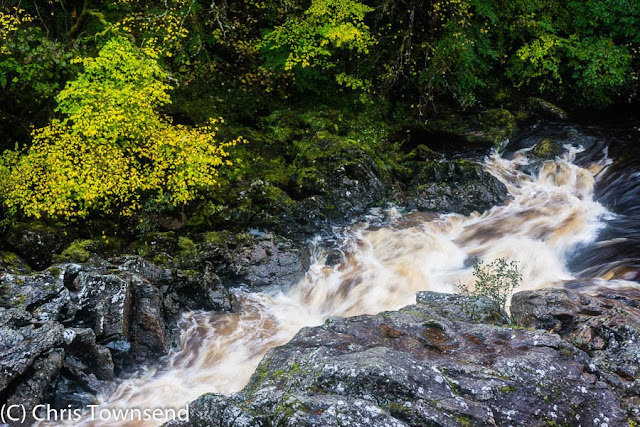 After recent rain and snowmelt the burns were full and thundering down and I was glad of the steeping stones. No sign now of the summer dryness. The green of summer has gone too, the grasses burnt orange, making the slopes look a burnished gold from a distance. 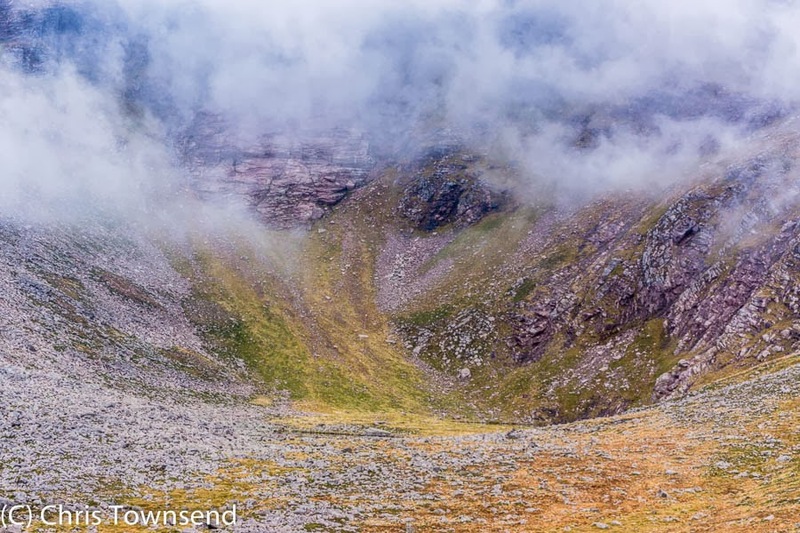 The first hint that the clouds might shift came as I looked into Coire an Lochain. 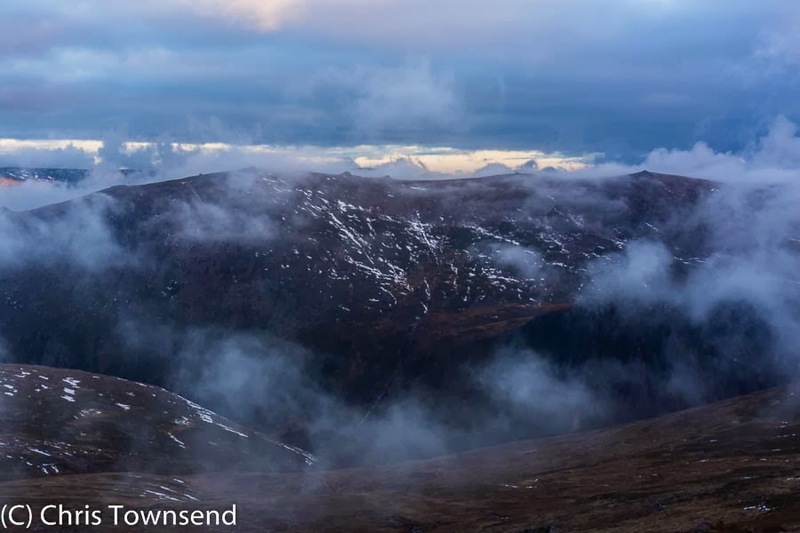 Rather than a solid dark line the mist was swirling and breaking, revealing dark crags and the last remnants of the snowfall of five days ago. As I climbed the shoulder of the corrie I went in and out of bands of mist. 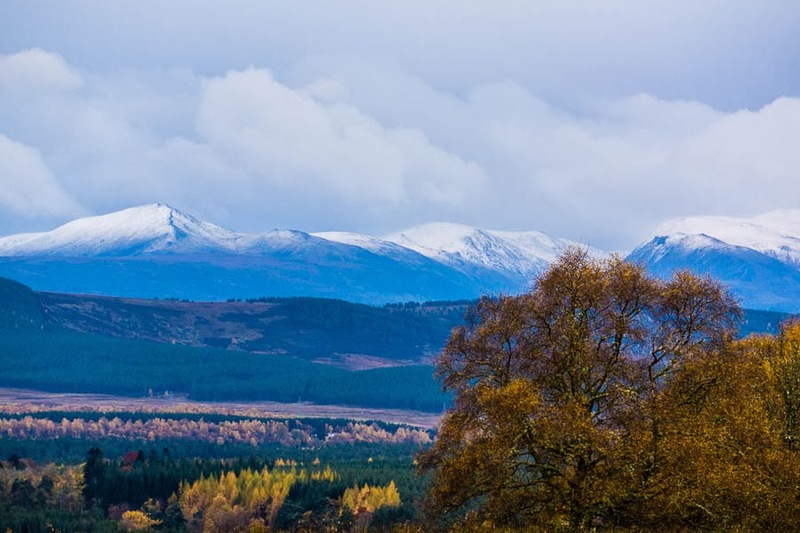 Looking back I could see the Meall a’Bhuachaille hills rising above mist-covered Glenmore Forest. 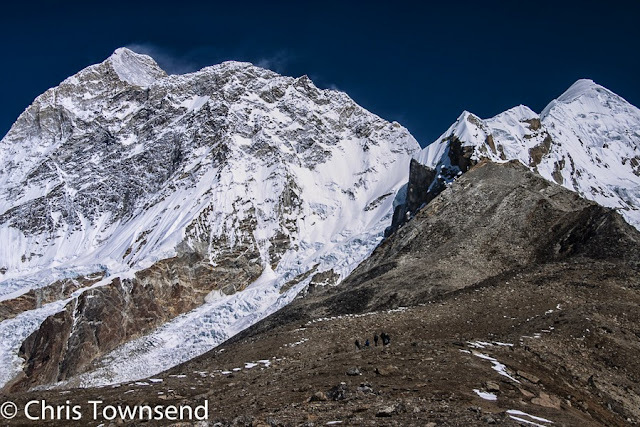 On reaching the Plateau I could see the cloud was dense to the south, a solid wall of darkness hiding the hills. 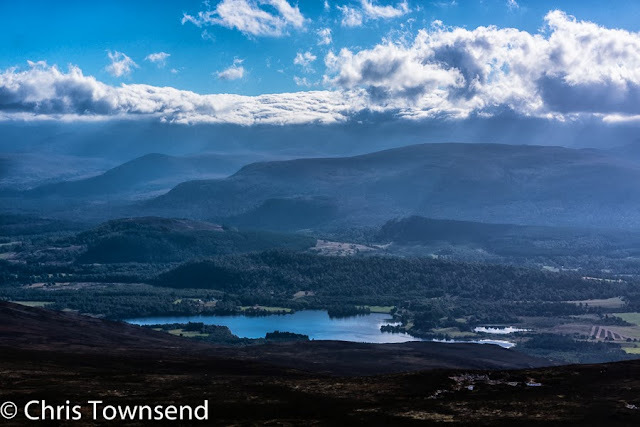 But along the rim of the corries, the northern edge of the Cairngorm Plateau, the mist was disintegrating into strips and patches that drifted gently over the tops. 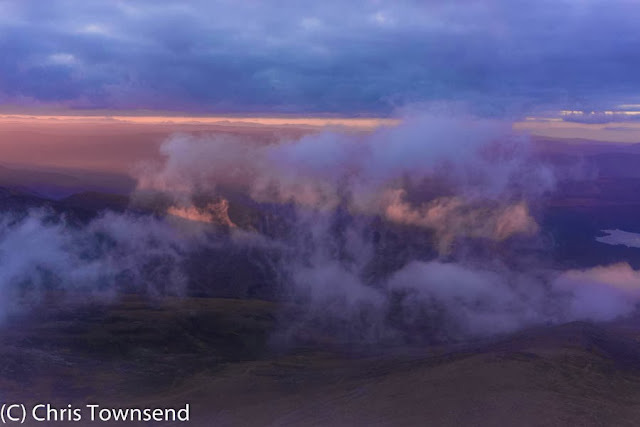 As I walked over the summits of Cairn Lochan and Stob Coire an t-Sneachda I went in and out of the cloud, the visibility shrinking to a few metres then spreading to tens of kilometres. 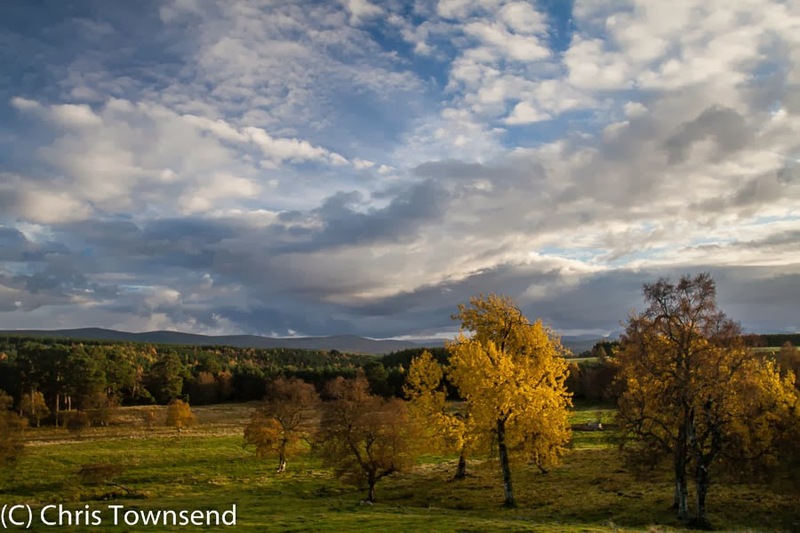 Beyond the hills in Strathspey the sun was shining. Up here the air was chill and damp and I was soon coated in a layer of fine moisture. The air was barely moving but even a gentle breath felt cold on the skin. 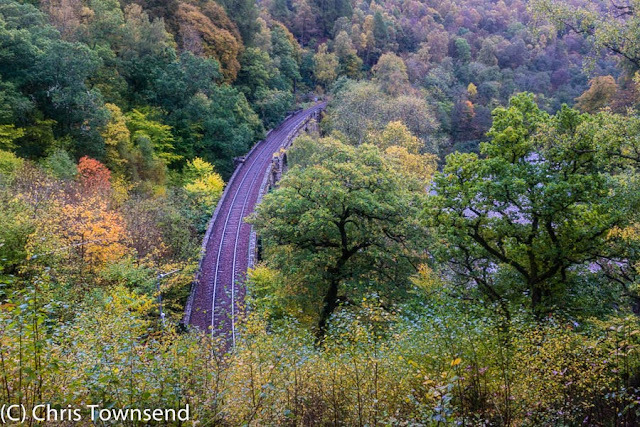 I’d set off late in the afternoon, planning on being high up at dusk when the light can be magical and intense. I had the hills to myself, others having descended before I’d even set off. They missed the best of the day. As I reached the top of the Fiacaill a’Choire Chais, the ridge down which I would descend, the first hints of pink appeared in the north-western sky. I stopped and watched as a streak of colour spread below a dense band of cloud, quickly deepening into a rich red. Drifting clouds caught the last rays of the sun. Then the sun itself appeared briefly between the cloud banks before sinking out of sight. Quickly the world turned to grey and darkness swept in as I dropped down the stony ridge. Later, when I drove home after a few hours in the Glenmore Lodge bar* with Daniel Neilson, The Great Outdoor’s Acting Editor and up here for a course you’ll be able to read about in a forthcoming issue, the mist had spread through the valley and I crept along, headlights dipped, visibility reduced to a few metres. Twice deer at the side of the road froze as I passed and I narrowly missed a few rabbits and pheasants, not seen until I was almost on top of them. *Beer and whisky for Daniel, coffee and ginger beer for me as I was driving, though I was sorely tempted by the Lodge’s superb whisky selection. I made do with a glass of Black Bottle, my favourite blended whisky, when I got home. The November issue of The Great Outdoors is out now and I have more than the usual amount of stuff in it, mostly about gear. 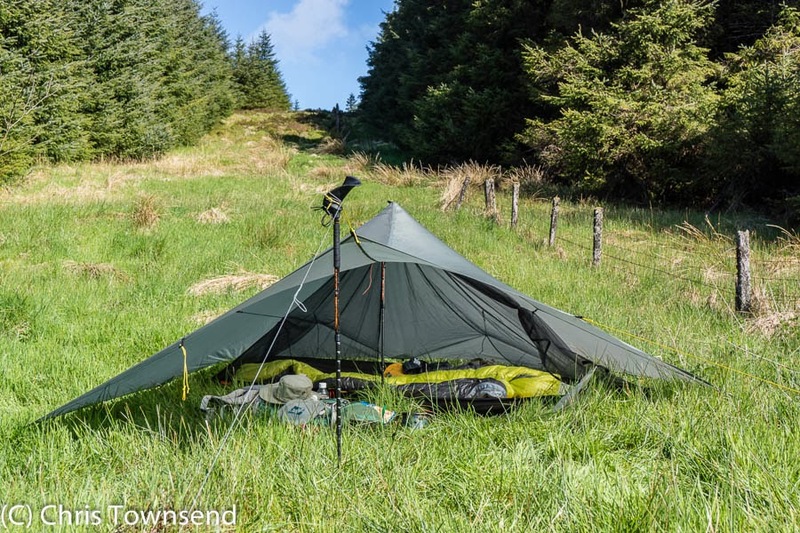 There's a report on how my gear performed on the two-month Scottish Watershed walk earlier this year. A walk like this really does test gear. 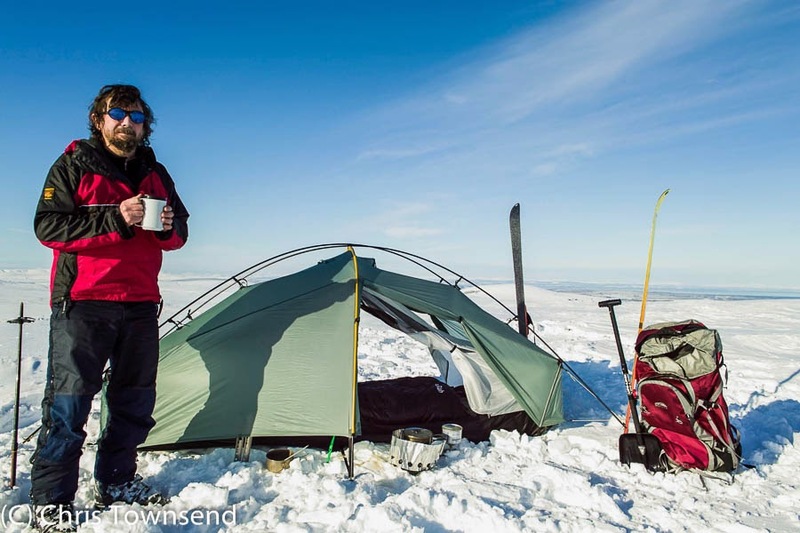 I also review 12 softshell jackets, look at some of the new gear that'll be appearing in the shops next year and describe what I carry to keep safe and warm in winter. 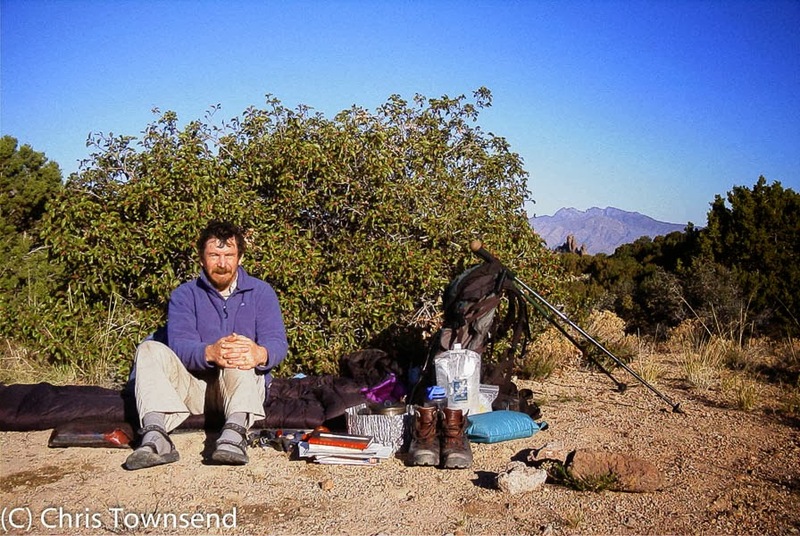 Away from gear my backpacking column celebrates autumn. Also in gear Daniel Neilson reviews 13 pairs of softshell trousers (a much better use for these fabrics than jackets in my opinion) and tests a luxurious and expensive merino wool midlayer from Icebreaker and an Arc'teryx jacket in the new Gore-Tex Pro fabric while James Reader tries Hi-Tec's V-Lite SpHike Mid WP lightweight boots (the name's an unwieldy mess but they do look good). There are some great photographs in this issue including a really dramatic one of Loch Tulla from David Lintern. 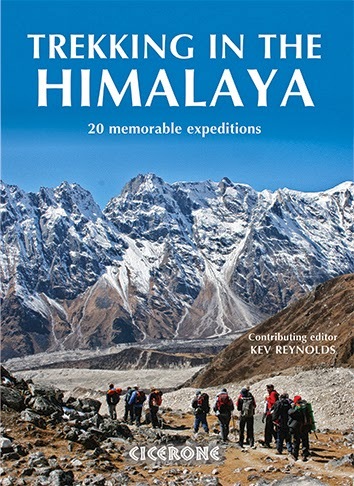 In words there's Everest mountaineer Doug Scott on My Hills; John Manning talking to Stephen Pern about his 3,482 mile walk round every bothy in England, Wales and Scotland, which sounds a fascinating trip; Hanna Lindon scrambling up rakes in the Lake District, with a great opening shot of the author tackling the crux of Jake's Rake; Ed Byrne joining members of the Cairngorms Mountain Rescue team on a walk up Braeriach; Ronald Turnbull exploring the drovers roads of Atholl; Ben Lerwill walking Tasmania's Overland Track; and hiker historian Edoardo Albert wandering along the Northumbrian coast. My thoughts on rewilding in the previous issue appear to have stimulated reactions from columnists Jim Perrin and Roger Smith. In his Hillwalker's Library I am delighted that Jim goes back to one of the key sources for rewilding ideas, Aldo Leopold's superb A Sand County Almanac, a book worth reading many times. Roger is cautious about introducing big predators but I have to say I don't think he quite understands why they are needed for rewilding and the effect they have on habitats. 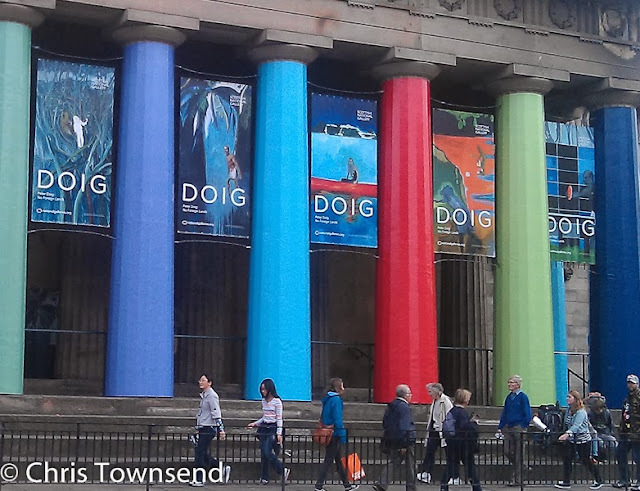 Leopold's books and those of Jim Crumley and George Monbiot I discussed in the last issue are worth reading on this and there's also my post from August and the discussion it elicited. 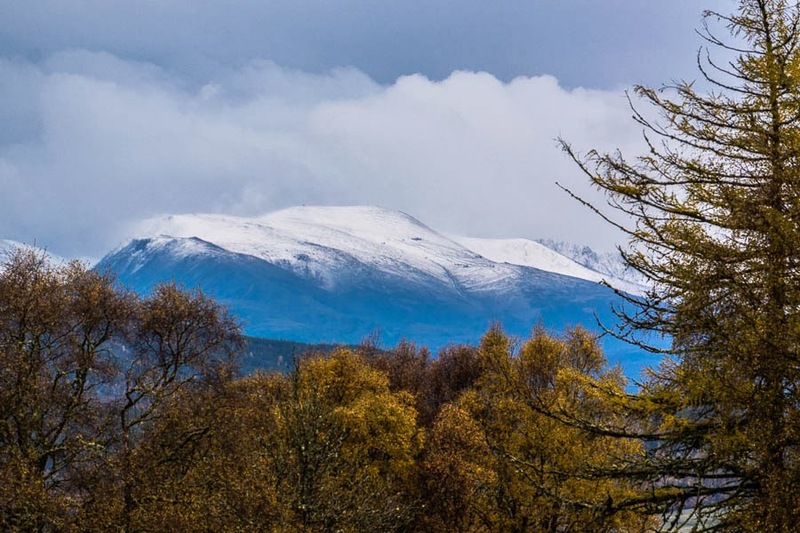 The Hill Skills section also has some good stuff with a guide on how to identify deciduous trees in winter from Sarah Ryan; Alan Halewood of Glenmore Lodge on avalanches and heuristic traps; and Lindsay Mears from the Met Office on changeable mountain temperatures. I like trees and over the years I’ve bought many books on woods and forests. 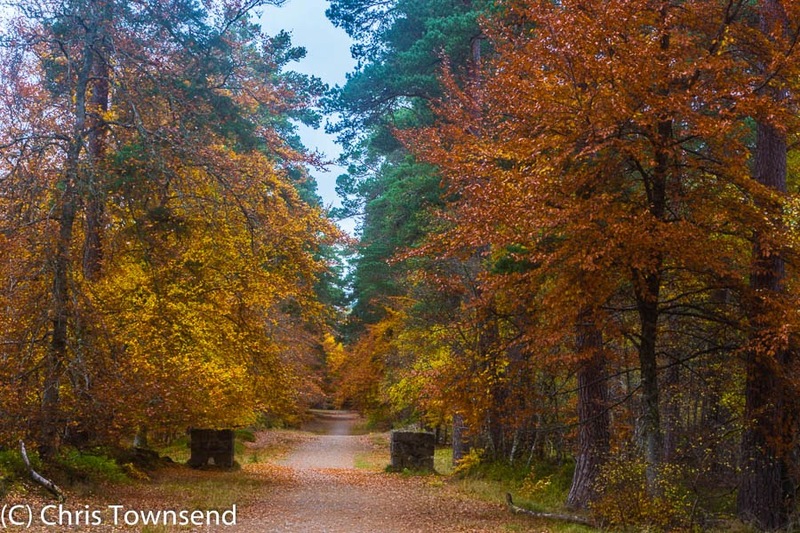 The latest, just out this year, is Clifton Bain’s The Ancient Pinewoods of Scotland. Subtitled A Traveller’s Guide this book describes 38 woods spread across the Highlands. The author visited every one - by public transport, bicycle and foot – and as well as a description and a little history provides travel notes with suggested routes. Browsing through this beautifully illustrated book I found many woods I’d never visited. One was close to home, along the River Dulnain in the Monadh Liath mountains. I’d visited the treeless upper Dulnain many times (see here for a trip last year) but had never walked the lower section. 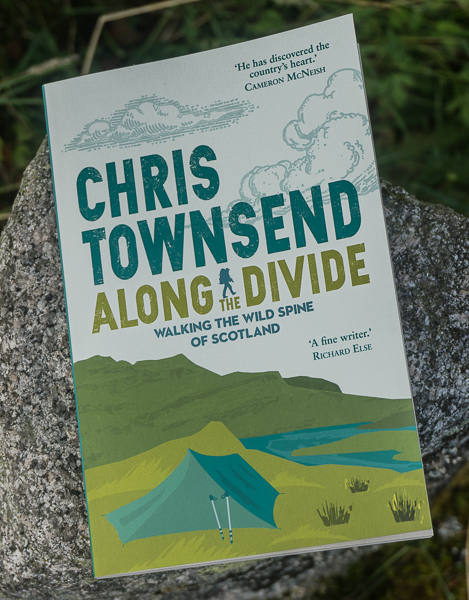 Inspired by this book I decided an overnight trip would be a good way to experience the woods (and also get a feel for how valuable the book was in the field – though I didn’t carry it as it’s too fine a book to risk damaging it and also rather heavy). A single track road through lovely birch and pine woods led from the little town of Carrbridge to a road end by an abandoned farmhouse. The forest stretched on beside the river, here twisting and turning in a wide valley. 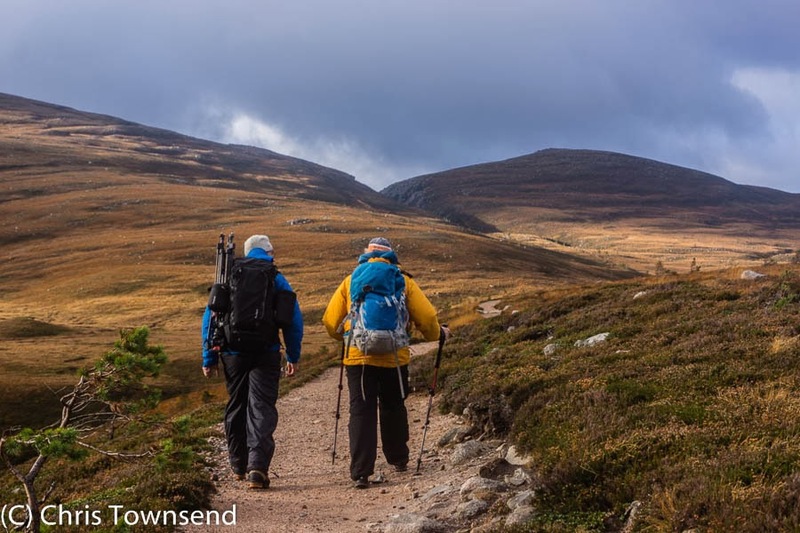 No path was marked on the map but there was one, narrow and, in places, sketchy, that led through the big pines and riverside meadows below the steep slopes of Garbh-mheall Mor. The day was warm for late September with no need for a jacket. The forest was open and varied, with some dense stands of pines, some big individuals standing alone and some scattered little copses. This was a natural forest with all the diversity that brings rather than a regimented plantation. 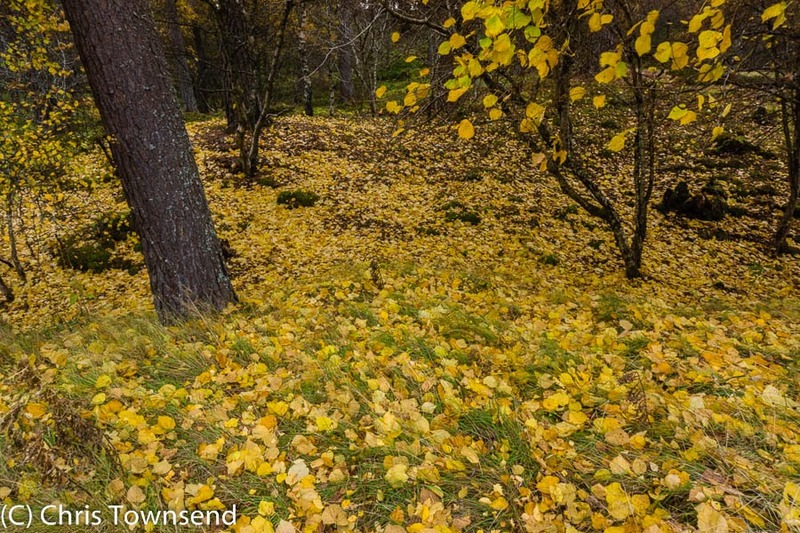 After some six kilometres the main section of the forest ended abruptly. Remnants of an old fence showed that it had once been enclosed, preventing grazing by deer and the sheep I could see dotted on a far hillside. Beyond the forest edge a few last old pines grew. 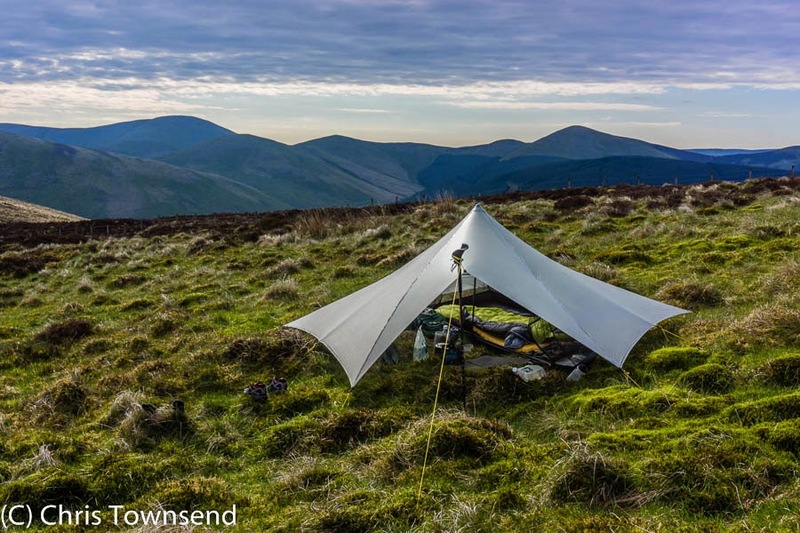 I found a good campsite beside one of these and pitched my tent with a view across the Dulnain to rolling heather moorland hills, an idyllic spot. A faint, briefly pink, sunset gave way to an intense starry sky. 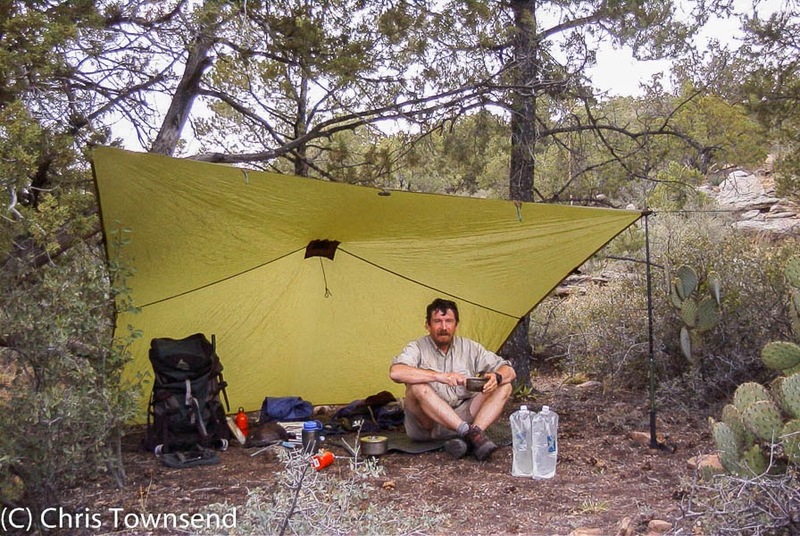 I lay in the tent with the doors open watching the heavens before falling asleep, to wake just once when a gusty wind shook the tent. Dawn came with a temperature barely above freezing. I could see the sun slowly creeping down the far hillside towards me. Despite the cold I sat outside over breakfast watching the world come to life. A golden eagle flapped slowly down the glen, massive and silent. Red grouse called loudly from the heather. Then as the sun warmed my camp a few midges appeared – I had hoped they were gone for the year. A couple of bites had me packing up and moving on. Following a side stream up beyond the woods I headed for the highest summit in the area, 824 metre Geal-charn Mor, from where I had wide views of the spreading Monadh Liath. A cold strong wind swept the top. 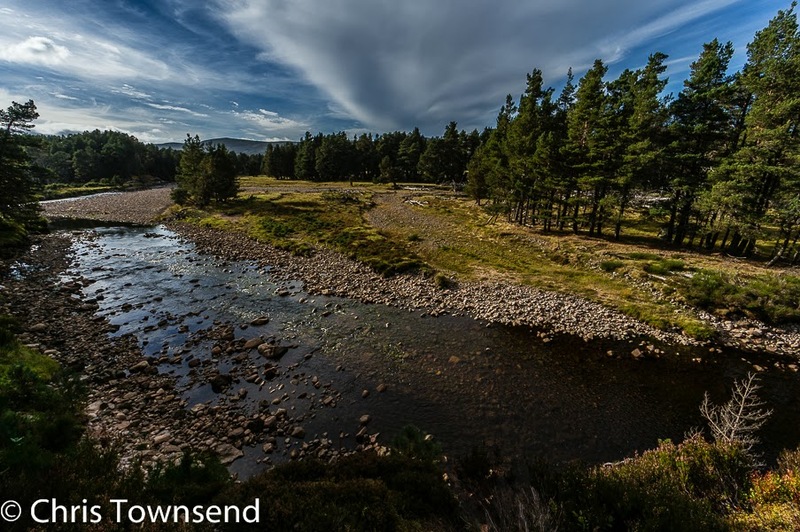 To the south dark clouds hung over the Cairngorms, though there was blue sky above them. 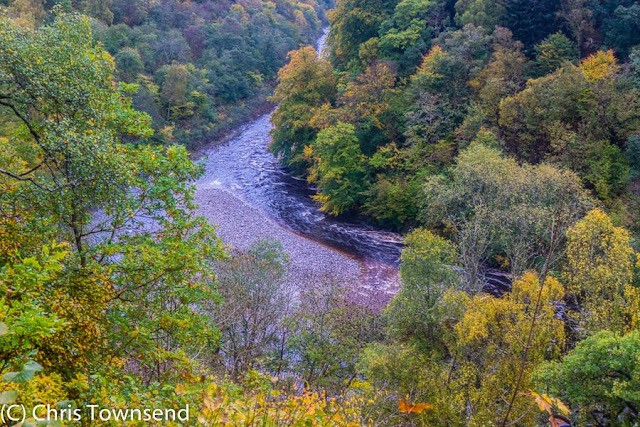 Turning from the summit I made a slow descent beside the Allt an t-Slugain Dhuibh, a tributary of the Dulnain.. 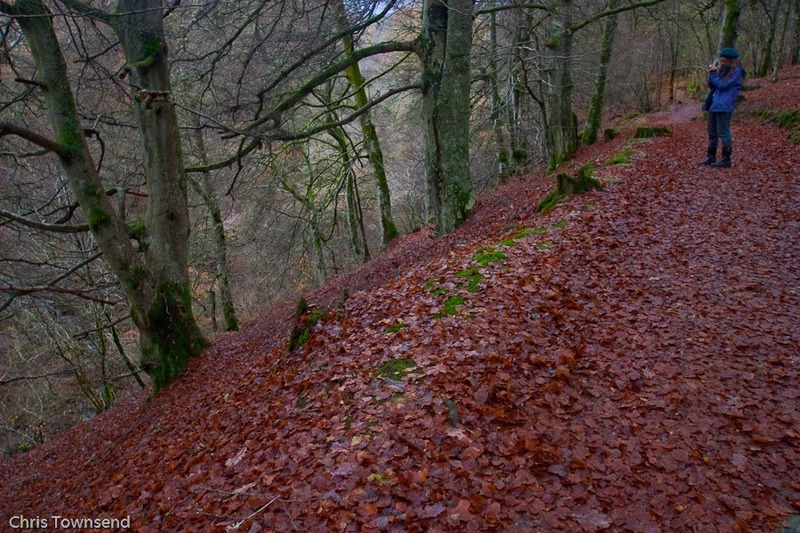 Slow because here the trees appeared again, well spread out and scattered across the hillsides. As I descended I noticed more and more dead tree trunks, bleached white with age. From The Ancient Pinewoods I learnt that these are the last remnants of a big fire over 70 years ago. Also and with delight I noticed many pine seedlings pushing up through the heather. Bain says that sheep grazing was stopped in the 1990s. These new trees are the result. In a decade or so this area will look very different. Clifton Bain’s book had taken me to some wonderful woods that were new to me and told me much about them. I’ll be using it to visit other woods in the future.